DNA 'bricks' can self-assemble into complex 3D shapes such as a miniature space shuttle. A tiny space shuttle made out of DNA "LEGO bricks" shows how scientists could someday build new technologies on the smallest scales. 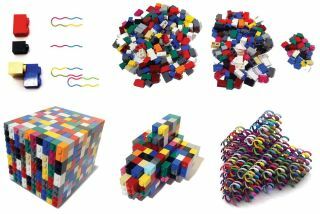 Single DNA strands became "LEGO bricks" that could assemble together by themselves into 102 individual 3D shapes. Harvard researchers manipulated the DNA coding of the bricks so that they could form solid shapes such as the tiny shuttle, honeycomb structures, and even "written" features on a solid base such as numbers and letters of the English alphabet. "Once we know how to compile the correct code of complex shapes and add it to the synthetic DNA strands, everything else is simple and natural," said Yonggang Ke, a chemist at Harvard University. "Those DNA strands are like smart LEGO bricks that know exactly where to go by themselves." DNA bricks offer a powerful new tool for building structures in the tiniest detail, according to Ke and his colleagues in their study detailed in the Nov. 29 online edition of the journal Science. The work could lead to tiny medical devices for delivering drugs inside the human body or next-generation computer circuits. But the DNA nanotechnology breakthrough also touches upon one of science's greatest mysteries — how life on Earth assembled itself from a jumble of molecules in the primordial ooze. A DNA strand's width is about 1 nanometer (1 billionth of a meter) — far smaller than a human hair's width of 60,000 nanometers. The idea of DNA bricks that can assemble into shapes on their own seems fantastical for humans used to building things step-by-step. But it's just a hint of what nature does all the time through self-assembly, Ke said. "All life forms on earth are self-assembled, in an environment of an enormous amount of small molecules and macromolecules, such as DNA, RNA and proteins — much, much messier than our small DNA "soup" in a test tube," Ke told TechNewsDaily. The Harvard lab of Peng Yin, senior author on the new study, had used DNA to build 2D shapes. The 3D breakthrough relied upon the bricks each consisting of a single DNA strand with 32 nucleotides — DNA's building block molecules — that can bind to as many as four neighboring bricks. The DNA bricks method takes a long time — one shape resembling a cube took 72 hours for self-assembly. But its success may still come as a pleasant surprise for researchers who doubted it could be done. DNA 'bricks' created 3D letter and number shapes as seen through computer modeling (left) and microscopy images (right). Many researchers believed that DNA self-assembly from hundreds or thousands of DNA strands would prove too complicated or inefficient. They previously relied on a DNA origami method that folded a main "scaffold" DNA strand into different shapes. Such origami folding takes place through the scaffold strand's interactions with many short "staple" DNA strands. But the DNA origami method required researchers to create specific scaffold strands and staple strands tailored for each unique shape they wanted to build. By comparison, the DNA bricks represent a standard set of building blocks that can flexibly join together to form many different shapes. That approach is also embraced by Kurt Gothelf, head of the Center for DNA Nanotechnology at Aarhus University in Denmark. Gothelf wrote an independent paper on the Harvard team's work in the latest issue of the journal Science. "In my vision for a fusion of the two methods you use a DNA origami core and then you can build various surfaces on this by the brick method," Gothelf explained. The DNA bricks method could quickly join the DNA origami method in helping scientists do lab research. Gothelf suggested that commercial uses of DNA bricks could also appear within the next five to 10 years. "Personally, I am enthusiastic about the potential application of DNA nanotechnology to make intelligent drug-delivery vehicles and to arrange and wire molecular electronic components," Gothelf said. Researchers may have figured out how to reliably design and make 3D shapes from DNA, but they still don't know how the DNA pulls off its seemingly miraculous trick of self-assembly. Nature figured out how self-assembly could create living beings of all sizes and shapes over billions of years of evolution, Ke said. Humans are "still playing catch-up with nature" by tinkering with the DNA bricks," Ke explained. But the possibilities could be endless. "For us, with limited time and resources, making structures about a millimeter in size in this decade would be very impressive," Ke said. "In term of shape complexity, I think virtually anything will be possible." This story was provided by TechNewsDaily, sister site to SPACE.com. You can follow TechNewsDaily Senior Writer Jeremy Hsu on Twitter @jeremyhsu. Follow TechNewsDaily on Twitter @TechNewsDaily, or on Facebook.